The Church of the Dormition was built on the banks of the Don more than a century ago, but as did many Russian churches, it fell into ruin after the godless authorities took power in 1917. But now, thanks to the active construction work that has been started at the church, the bells once again ring out, and services are held, despite the fact there is as yet no heating and no iconostasis. The crew working on the very church comes from various places throughout the local diocese and beyond, but they all have one thing in common—they were formerly homeless, and many of them drug addicts, reports TASS. “In principle, all the homeless and drug addicts from the churches in the diocese are sent to us. It’s a very interesting phenomenon—that the church is being restored by people with such a fate,” explained Fr. Eugene, the rector of the church, who also serves at the Church of the Holy Protection on the outskirts of Rostov-on-Don. And for their labors, the former homeless have found a home—3 of them live in a trailer at the church construction site, and 9 others at the Church of the Holy Protection. Moreover, Fr. Eugene says, in his seven years of outreach to the poor and homeless and destitute, 14 men have found wives and started families. And not only do the men work with Fr. Eugene, but they also relax and spend time together: They play soccer, they go to the lake where Fr. Eugene gives master classes on fishing, sometimes they go to a concert or to the movies, and so on. The Church of the Dormition was built in 1908 by Old Believer Cossacks. It was closed in the early 1960s to make way for an elementary school, and did not function as a church for nearly 50 years. 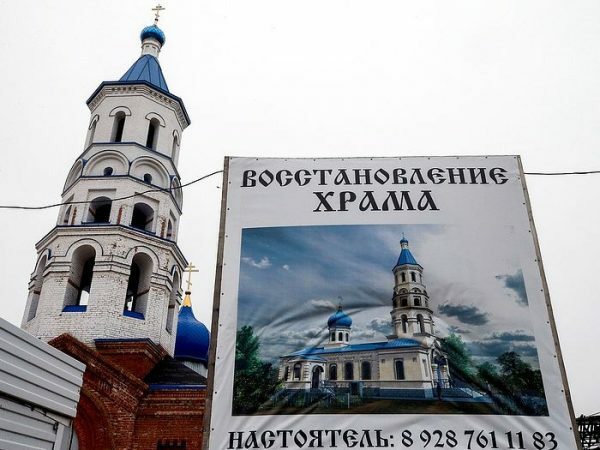 The church was transferred to the Russian Orthodox Church in 2011-2012, and serious restoration work began in 2014. The main work has been completed. Ancient icons have already been hung on the walls—it remains to run heating, lay the floors, and make an iconostasis. Services are currently held in the church twice a week, on Saturdays and Sundays.